This article will give you a thorough introduction to what Bitcoin is, how it was created, how it works, what gives it value, and how it differs from regular national currencies, especially in the context of Keynesian and Austrian economic theory. In the end is also a brief account of what the technology behind Bitcoin can be used for in addition to the application as money. The convention is to use uppercase letter (Bitcoin) when talking about the payment network, software and community, and to use lowercase letter (bitcoin) when talking about units of the currency. 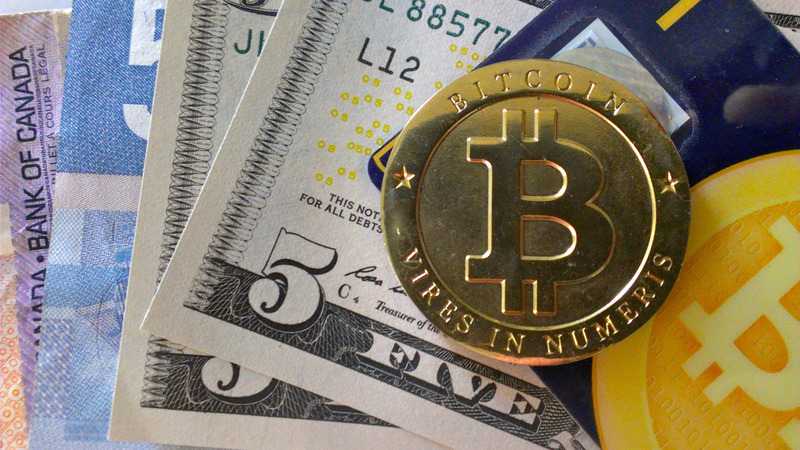 Unlike other currencies, Bitcoin is both a payment network and a currency simultaneously. This makes it fundamentally different from regular currencies such as the US dollar where the currency and payment networks are separate parts. To understand the significance of this it can be helpful to make an analogy. Imagine Bitcoin as a car that is simultaneously the road it is traveling on. This car can travel anywhere in the world and there are no border guards or third parties who can stop it or charge an extra fee for its travel. An electronic US dollar in this car analogy would need permission to travel on roads built and owned by third parties who determines the rules and may charge fees along the way, or simply stop unwanted “cars” from reaching there destination for whatever reason. Bitcoin is the world’s first decentralized electronic currency. In November 2008, an article was published with the title ”Bitcoin: A Peer-to-Peer Electronic Cash System” by the pseudonym ”Satoshi Nakamoto” to an email list for cryptography on metzdowd.com. The article describes how a peer-to-peer electronic cash system can be created that makes it possible to send money directly between two parties without intermediaries. The anonymous creator (or creators) of Bitcoin was the first to find a solution to how double-spending can be avoided in a decentralized electronic payment network. This problem had until then made it impossible to create an electronic currency without a central trusted third party to verify that the digital coins are not copied and used multiple times. The solution consists of all transactions being publicly published to all participants (nodes) in the network and for all participants to agree on a common history of every transaction which is locked cryptographically in a chronological chain of transaction blocks (a blockchain) through a process called proof-of-work. Proof-of-work is used to ensure that the longest blockchain was created by the majority of the computing power in the network, and it is always the longest blockchain that is considered as the correct transaction history. Bitcoin uses proof-of-work to solve the computer science problem “Byzantine Generals’ Problem” which concerns how different participants in an insecure communication network can coordinate with each other in a safe manner. Incentives for verifying transactions, i.e. to lock in transactions in the blockchain by spending computational power, is given by rewarding those who manage to compute a cryptographic solution to a transaction block with a predetermined number of newly created bitcoins, and additionally they receive all the transaction fees that the transactions in the block contains. This process of creating new bitcoins by performing calculations that verifies transactions is called mining, it has similarities with the way new gold is put in circulation. The difficulty of finding a cryptographic solution to a block of transactions is automatically adjusted so that it takes on average 10 minutes for all the computing power connected to the network to randomly find a solution. 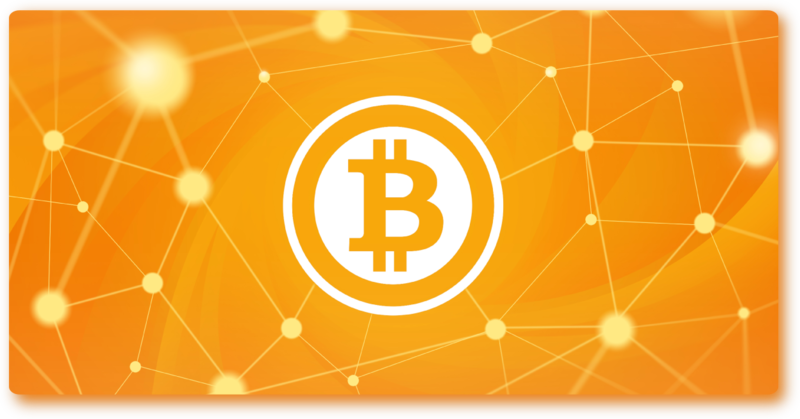 All bitcoins that exists has been created as reward for solving blocks in the blockchain. From the beginning the reward was 50 new bitcoin per block, but every four years the reward is halved. 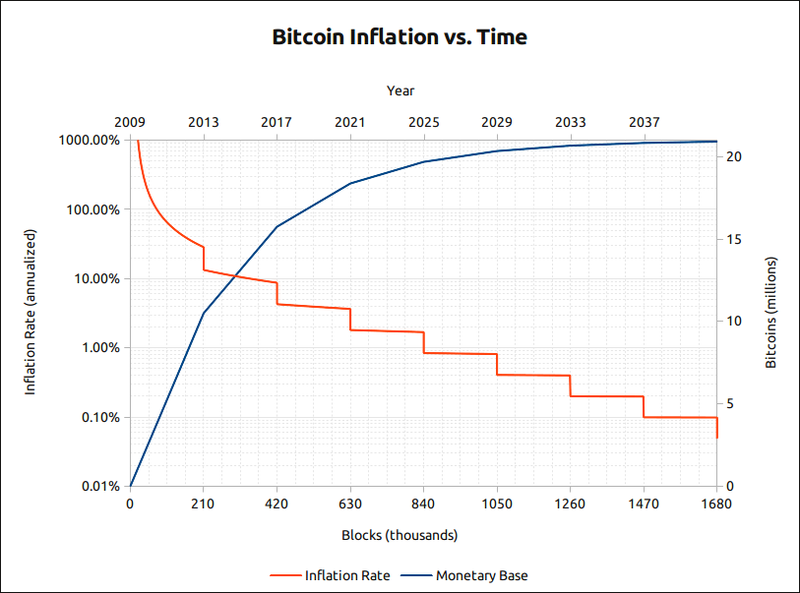 The rate of increase (inflation) of bitcoin is thus high in the beginning but halves every four years, and the total number of bitcoins will eventually level off at 21 million. Each bitcoin is divisible into 100 million pieces, where the smallest unit 0.00000001 bitcoin is called one Satoshi. The registered transactions in the blockchain is secure against manipulation as long as a cooperating group of malevolent actors do not control more than 50% of the computational power of the entire network. To modify an existing block in the blockchain a malicious actor would have to redo the proof-of-work needed for that specific block and all subsequent blocks, and catch up to become the longest chain. To do this requires a large percentage of the total computing power of the network and the probability of being able to modify a previous block falls rapidly with the number of new blocks added after that block. If a malicious actor manages to come over more computing power than all others together, he can choose between two possibilities. The first option is to steal back his payments (double spend) and have power to determine which transactions he will allow others to make. The other option is to follow the rules and look forward to being awarded more bitcoins than everyone else combined in the future rather than undermining the credibility of the entire network and the basis of his own wealth. In Bitcoin all transactions are public in a similar way as in a stock market. Everyone can see which transactions take place, there size and time, but they can be anonymous as long as no personal identities are associated with the individual account addresses used. However, in practice it is much more difficult to make anonymous transactions with bitcoin than with cash. The price of Bitcoin is determined solely by supply and demand in what constitutes one of the world’s most free global markets. When Bitcoin was first started in early 2009, bitcoins had no market value. One of the first known transactions that prescribed a value to bitcoin was initiated on the forum bitcointalk.org in May 2010 when the forum member Laszlo from Florida offered to pay 10,000 bitcoins for two pizzas. The principle of how the price of bitcoins has increased since then is described by Ludwig von Mises’ regression theorem. This Theorem explains how something can go from being subjectively valued to something that obtains a more objective exchange value, such as money. For something to be considered as money it needs to function as a medium of exchange, a measure of value and a way to store value. To be able to this as well as possible there are nine characteristics that determine what is good money. Those are: limited quantity, durability, portability, divisibility, ease of recognition, ease of storage, fungibility, difficulty to forge, and widespread use. The currency bitcoin can be thought of as price deflationary, i.e., the value of the currency will increase over time if bitcoin becomes a generally accepted currency, as the total number of bitcoins will never exceed 21 million. This means that prices of goods and services will fall in terms of bitcoins if the productivity of the economy continues to increase as more goods and services will chase the same amount of bitcoins. Keynesian economists argue that price deflation is bad for primarily three reasons. First, it provides an incentive to save rather than to consume, and it reduces the incentive to borrow money. second, the real debt burden of borrowers will increase over time, and third, they argue that nominal wage cuts would be difficult to implement. According to Keynesian economics, it is desirable to push down lending rates and expand the money supply to provide incentives for increased borrowing and increased consumption in order to increase the economic activity to create more jobs. Austrian economists argue on the contrary that the expansion of the total money supply (inflation) and depression of interest rates to artificially low levels is negative for the economy as a whole and the main cause of the business cycle. This is because the artificially depressed interest rates do not reflect the time preference of society, i.e. how much people are willing to postpone consumption in the present, in anticipation of a larger reward later. The artificially low interest rates means that investments can be made, that in a normal situation would not be profitable, because they are not sufficiently demanded by consumers. The aggregated undesired investments made possible through artificially low interest rates shows up sooner or later through a recession where businesses without sufficient demand for their products goes bankrupt resulting in high unemployment. In recessions Keynesian economists usually demands stimulus through the creation of even more money, even lower interest rates and more government spending, resulting in a temporary boom in which a new round of undesired investment are made because of artificially low interest rates and a large supply of new money and credit, and so it continues with booms and busts caused by centrally controlled manipulation of interest rates and money supply. With a currency that increases in value over time as the economy grows people would probably not spend money on unnecessary consumption and be more thoughtful how they spend their money. This does not mean that they will stop consuming. If that were the case no computers or mobile phones would be sold since they are subject to rapid price deflation, constantly getting better and decreasing in price. In an economy without expansion of the money supply and manipulation of interest rates, the interest rates would be determined by the amount of savings in the economy, reflecting the time preference of society. A currency that increases in value over time provides incentives for saving, which probably would give rise to a large amount of saved money and this would naturally drive down interest rates. In an economy with price deflation an employer would not need to raise wages to compensate for increasing prices, but in real terms the salary would go up even if it was standing still nominally. If the rest of the economy is much more productive than a individual company, the value of the currency would rise faster than the profit of the individual company. This means that the product or service that the company produces is not demanded by society at the price they are capable of producing it. It is a signal from society that it would be better if they devoted their energy to produce something else that is more in demand. There are also historical examples where wages have fallen over 50% in nominal terms due to contraction of the total money supply in society (real deflation). The biggest reason however why Keynesian economists want to make people terrified of deflation is probably because we live in a debt-based economy. In the economy we live in today about 97% of all circulating money is only credit, created by commercial banks on people’s bank accounts. This is clearly stated openly in this press release on money creation from Bank of England. This means that if a large proportion of bank customers would withdraw their money at the same time, the banks wouldn’t have coverage for it. This would lead to a chain reaction of banks going bankrupt and a large amount of money represented on people’s bank accounts would disappear from circulation. This would lead to a real deflation where the total amount of money decreases, in contrast to a price deflation where only the price decreases and not the total amount of money. If bitcoin would become a dominant currency, centrally controlled manipulation of the economy through regulating money supply and interest rates would no longer be possible. In addition, bitcoin is not created through somebodies debt. Another important aspect of Bitcoin is that transactions are irreversible. This reduces transaction costs and demands for identifications. In traditional payment networks, payments are reversible, which means that banks can not escape handling disputes. This in turn makes transaction costs higher and small transactions disproportionately expensive. Reversible transactions puts merchants in danger of being cheated, and for this reason they will insist on more information about their customers than they would otherwise need to protect themselves. Because bitcoin transactions can not be reversed it is possible to safely receive payments from anonymous persons and persons you do not trust. This has always been possible with physical cash, but over electronic channels, this has not been possible before Bitcoin. Another important aspect is that Bitcoin is completely open source software. Anyone with sufficient programming skills can check, copy, and if they want to start their own version of Bitcoin. There are thousands of different crypto-currencies created this way but Bitcoin is by far the dominant in terms of market value, GitHub repositories, venture capital investment, merchant adoption, and many other metrics. Bitcoin is a protocol – a language that computers use to communicate with each other over the internet. In the same way that computers use the SMTP protocol to send email on the Internet and TCP / IP is one of the main protocols for creating the Internet. In this introductory text to Bitcoin, I have omitted other applications of the blockchain technology than for use as currency. The blockchain is a technology for recording ownership and trust in a decentralized way. There is much more that can be decentralized using this technology. To quote Andreas AntonopoIous ”Saying that Bitcoin is a currency is like saying that the internet is email. Currency is just the first app!”. All services currently performed via a central party can be and most likely will be decentralized and provided for lower cost in the future based on blockchain technology, e.g. trading, stocks, bonds, contracts, notary services, insurance, matchmaking services, law, dispute resolution, communication, crowdfunding, and much more. 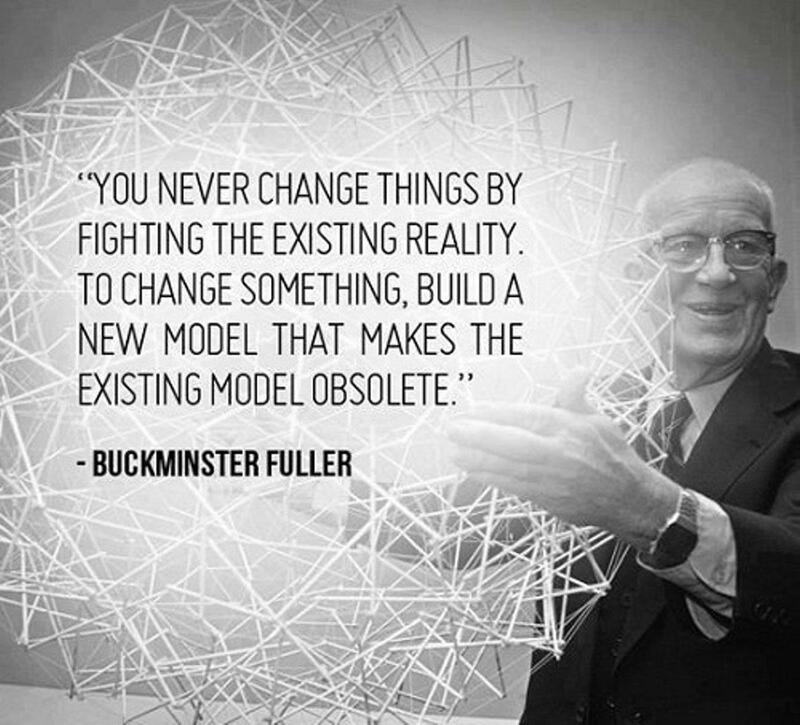 Decentralization means that the power is distributed and this reduces the possibility of corruption. Will bitcoin or some other decentralized cryptocurrency become a dominant global currency in the future? Only time will tell! Den här artikeln är tänkt att ge en introduktion till vad Bitcoin är, hur det skapades, hur det fungerar, vad som gör att Bitcoin har ett värde, samt hur Bitcoin skiljer sig från vanliga nationella valutor, och då särskilt i jämförelsen mellan Keynesiansk och Österrikisk ekonomisk teori. Sist ges också en kort kommentar om vad teknologin bakom Bitcoin kan användas till utöver tillämpningen som valuta. Konventionen är att använda stor första bokstav (Bitcoin) när man talar om Bitcoin som betalningsnätverk, mjukvara och community, samt att använda liten första bokstav (bitcoin) när man talar om enheter av valutan. Till skillnad mot andra valutor har Bitcoin den unika egenskapen att den både är ett betalningsnätverk och en valuta samtidigt. Detta skiljer sig fundamentalt från andra valutor så som svenska kronor där valuta och betalningsnätverk är separata delar. För att förstå betydelsen av detta så kan man göra en abstrakt liknelse med bilar. Föreställ dig Bitcoin som en bil som samtidigt är vägen som den färdas på. Denna bil har möjlighet att färdas var som helst i världen och det finns inga gränsvakter, tullar eller andra utomstående tredjeparter som kan stoppa den eller ta ut en extra avgift för dess färd. En elektronisk svensk krona som bil skulle med samma liknelse behöva tillåtelse för att färdas på vägar byggda och ägda av andra parter och dessa i sin tur bestämmer reglerna och kan ta ut extra avgifter längs vägen. beskriver hur ett peer-to-peer elektroniskt kontantsystem kan skapas som gör det möjligt att skicka pengar direkt mellan två parter utan mellanhänder. elektronisk valuta utan en central anförtrodd tredje part som verifierar att de digitala mynten inte kopieras och används flera gånger. Lösningen består i att alla transaktioner annonseras ut publikt till alla deltagare (noder) i nätverket och för att alla ska vara överens om en gemensam historia över alla transaktioner så låses de kryptografiskt i en kronologisk kedja av transaktionsblock (blockkedjan) genom en process som kallas proof-of-work . Proof-of-work garanterar att den längsta blockkedjan skapats genom att spendera mest beräkningskraft och det är alltid den längsta blockkedjan som gäller som ett majoritetsbeslut över transaktionshistorien. Bitcoin var först med att använda proof-of-work för att lösa det datorvetenskapliga problemet Byzantine Generals’ Problem som handlar om hur flera olika deltagare i ett osäkert kommunikationsnätverk kan koordinera sig med varandra på ett säkert sätt [5, 6]. Det registrerade händelseförloppet av transaktioner i blockkedjan är säkert mot manipulation av transaktioner så länge inte en samarbetande grupp illvilliga aktörer kontrollerar mer än 50% av beräkningskraften i nätverket . För att modifiera ett tidigare block i kedjan skulle en illvillig aktör behöva göra om det proof-of-work som behövs för det blocket och alla efterföljande block samt hinna ikapp och bli den längsta kedjan. För att det ska vara möjligt så krävs en stor andel av den totala beräkningskraften i nätverket och sannolikheten för att lyckas modifiera ett tidigare block sjunker snabbt med antalet nya block som adderats efter det blocket . Vid en transaktion med bitcoin så brukar det antal block i blockkedjan som adderas efter blocket med den transaktionen kallas antalet ”konfirmationer”. Det är ett mått på hur säkert det är att transaktionen är irreversibel och inte kan dubbelspenderas även om någon skulle försöka sig på en 50%-attack. Incitament till att verifiera transaktioner, det vill säga att låsa in transaktioner i blockkedjan genom att spendera beräkningskraft, ges av att den som lyckas beräkna den kryptografiska lösningen till ett transaktionsblock belönas med ett förutbestämt antal nyskapade bitcoin och dessutom tilldelas transaktionsavgifter från de transaktioner som blocket innehåller. Denna process att ”gräva” fram nya bitcoin genom att utföra beräkningar och verifiera transaktioner brukar kallas mining eftersom det har likheter med sättet som guld sätts i cirkulation. Svårigheten att beräkna ett block anpassas automatiskt så att det tar i genomsnitt 10 minuter för all beräkningskraft ansluten till nätverket att slumpmässigt hitta en lösning. Alla bitcoin som finns har skapats på detta sätt som belöning för beräknade lösningar till transaktionsblock i blockkedjan. Från början var belöningen 50 bitcoin per block men cirka vart fjärde år halveras belöningen . Ökningstakten (inflationen) av bitcoin är alltså hög i början men halveras vart fjärde år och totala antalet bitcoin kommer så småningom att plana ut på 21 miljoner. Varje bitcoin är delbar i 100 miljoner delar där den minsta enheten 0,00000001 bitcoin kallas 1 Satoshi. Om en illvillig aktör lyckas komma över mer beräkningskraft än alla andra tillsammans så har denne att välja på två möjligheter. Det första alternativet är att kunna stjäla tillbaka sina egna betalningar och ha stor makt att avgöra vilka transaktioner som kan genomföras. Det andra alternativet är att följa spelreglerna och se fram emot att tilldelas mer bitcoin än alla andra sammanlagt i framtiden hellre än att underminera trovärdigheten för hela nätverket och grunden för sin egen rikedom . I Bitcoin är alla transaktioner publika på liknande sätt som på en aktiemarknad. Man kan se vilka transaktioner som sker, dess storlek och tidpunkt, men de är anonyma så länge inte identiteter kan kopplas till enskilda kontoadresser. I praktiken är det mycket svårare att göra anonyma transaktioner med bitcoin än med kontanter. Priset på bitcoin avgörs endast av utbud och efterfrågan på vad som utgör en av världens friaste globala marknader. När Bitcoin först startades i början av 2009 så hade valutan bitcoin inget värde alls. En av de första kända transaktionerna som tillskrev bitcoin ett värde initierades på forumet bitcointalk.org i maj 2010 då forummedlemmen laszlo från Florida erbjöd att betala 10 000 bitcoin för två pizzor . Principen för hur priset på bitcoin ökat sedan dess beskrivs av Ludwig von Mises regressionsteorem . Det handlar om hur något kan gå från att vara subjektivt värderat till att det erhåller ett mer objektivt bytesvärde så som pengar . För att något ska betraktas som pengar så behöver det kunna fungera som ett medium för utbyte, ett mått på värde och ett sätt att lagra värde. För att kunna göra det så väl som möjligt så finns det nio egenskaper som avgör vad som är bra pengar: begränsad mängd, hållbarhet, flyttbarhet, delbarhet, lättigenkänlighet, lätthet att förvara, utbytbarhet, svårighet att förfalska, och utbredd användning . Valutan bitcoin är i grunden prisdeflationistisk, det vill säga att värdet på valutan kommer att öka över tid förutsatt att bitcoin blir allmänt accepterat som valuta, eftersom totala antalet bitcoin aldrig kommer att överstiga 21 miljoner. Det innebär att priser kommer att falla räknat i bitcoin om produktiviteten i ekonomin fortsätter att öka då fler varor jagar samma mängd bitcoin. Keynesianska ekonomer hävdar att prisdeflation är dåligt av framförallt tre anledningar. För det första att det ger incitament till att spara istället för att konsumera samt att det minskar incitamenten att ta lån, för det andra att den reella skuldbördan för låntagare blir högre med tiden och för det tredje för att nominella lönesänkningar hävdas vara svåra att genomföra . Enligt Keynesianska ekonomer så är det därför önskvärt att genom utökad penningmängd kunna pressa ner utlåningsräntan för att ge incitament till ökad belåning och ökad konsumtion i syfte att öka den ekonomiska aktiviteten och därmed skapa fler jobb . Österrikiska ekonomer hävdar tvärtom att utökningen av den totala penningmängden (inflationen) och nedpressandet av räntan till artificiellt låga nivåer är negativt för ekonomin som helhet och främsta orsaken till konjunkturcykeln. Detta eftersom de nerpressade räntorna inte reflekterar samhällets tidspreferens, det vill säga hur mycket folk är villiga att skjuta upp konsumtion i nuet i förväntan av en större belöning längre fram . De lägre räntorna gör att investeringar kan göras, som i ett normalläge inte skulle vara lönsamma, eftersom de inte efterfrågas i tillräckligt hög grad av konsumenterna. 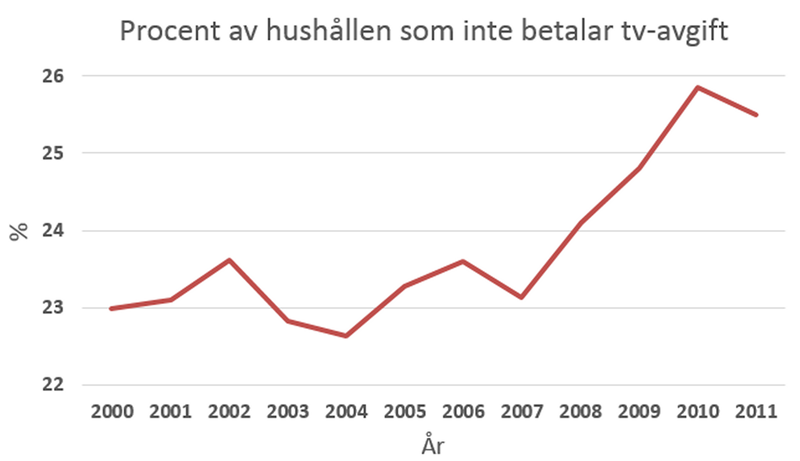 De aggregerade felinvesteringarna som blir resultatet av de artificiellt låga räntorna visar sig förr eller senare genom en lågkonjunktur där företag utan tillräcklig efterfrågan på sina produkter går i konkurs och det blir hög arbetslöshet. Lågkonjunkturer brukar från Keynesianska ekonomer resultera i krav på stimulanser genom skapandet av ännu mer pengar, ännu lägre räntor och statligt spenderande vilket resulterar i en högkonjunktur där nya felinvesteringar görs på grund av för låga räntor och stor tillgång på nya pengar och krediter. Med en valuta som ökar i värde över tid i takt med att ekonomin växer så skulle människor förmodligen inte lägga pengar på onödig konsumtion utan vara mer eftertänksamma hur de spenderar sina pengar. Detta betyder inte att de kommer att sluta konsumera. Om det vore så skulle inga datorer och mobiltelefoner kunna säljas eftersom de ständigt blir bättre och minskar i pris. I en ekonomi utan utökning av penningmängden och manipulering av räntan så skulle räntenivån bestämmas av sparandet. En valuta som ökar i värde med tiden ger incitament till sparande vilket förmodligen skulle ge upphov till ett stort utbud av sparade pengar och detta skulle naturligt pressa ner räntorna. I en ekonomi med prisdeflation skulle inte arbetsgivaren behöva höja lönerna eftersom i reella termer så höjs ändå lönen fast den ligger stilla nominellt. Om övriga ekonomin är mycket mer produktiv än ett enskilt företag så kommer värdet på valutan öka i snabbare takt än vinsten i det enskilda företaget. Det innebär att den vara eller tjänst som företaget producerar inte efterfrågas av samhället till det pris de är kapabla att producera till. Det är en signal från samhället att det skulle vara bättre om de ägnade sin energi åt att producera något annat som är mer efterfrågat. Det finns även historiska exempel där lönerna sjunkit över 50% i nominella termer på grund av kontraktion av den totala penningmängden i samhället (verklig deflation) . Den största anledningen till att Keynesianska ekonomer vill göra människor livrädda för deflation är förmodligen för att vi lever i en skuldbaserad ekonomi. I den ekonomi vi lever i idag är cirka 97% av alla pengar endast krediter som skapats av kommersiella banker på människors konton . Detta innebär att om en stor andel bankkunder vill plocka ut sina pengar samtidigt så har inte bankerna täckning för det. Detta skulle leda till en kedjereaktion av banker som går i konkurs och en stor mängd pengar representerade på människors bankkonton skulle försvinna ur cirkulation. Detta skulle alltså leda till en verklig deflation där den totala mängden pengar minskar, i kontrast till en prisdeflation där endast priset minskar och inte den totala mängden pengar. Om bitcoin blir dominerande som valuta så skulle inte centralstyrd manipulation av ekonomin genom valutamängd och ränta vara möjlig. Dessutom är bitcoin inte skapat ur någon annans skuld. En annan viktig aspekt av Bitcoin är att transaktioner är irreversibla vilket minskar transaktionskostnader och krav på identifikationer. I traditionella betalningsnätverk är betalningar reversibla vilket gör att banker inte kan undgå att hantera tvister. Detta i sin tur gör transaktionskostnader högre och att små transaktioner blir oproportionerligt dyra. Reversibla transaktioner gör att handlare riskerar att luras på pengar och därför kan de behöva insistera på mer information om sina kunder än de annars skulle behöva för att skydda sig. Att bitcointransaktioner inte kan reverseras gör det möjligt att utan risk ta emot betalningar från helt anonyma personer och personer som man inte har något förtroende för eller relation till. Detta har sedan urminnes tider varit möjligt med fysiska kontanter, men över elektroniska kanaler har det inte funnits den möjligheten innan Bitcoin. En annan viktig aspekt är att Bitcoin är helt öppen mjukvara (open source). Alla med tillräckliga programmeringskunskaper kan kontrollera, kopiera, och om de vill starta en egen variant av Bitcoin. Det finns hundratals olika kryptovalutor som skapats på detta sätt men Bitcoin är den överlägset dominerande sett till marknadsvärde . Bitcoin som protokoll är ett språk som datorer använder för att kommunicera med varandra över internet. På samma sätt som datorer använder SMTP-protokollet för att skicka e-post på internet och TCP/IP är det viktigaste protokollet för att skapa själva internet. I denna introduktionstext till Bitcoin har jag helt utelämnat andra applikationer av blockkedjeteknologin än användningen som valuta. Det finns mycket mer som kan decentraliseras med denna teknologi. I princip kan man tänka sig att alla tjänster som idag utförs via en central part över internet kommer att kunna göras decentraliserat till lägre kostnad i framtiden baserat på blockkedjeteknologi; Handel, Aktier, Kontrakt, Notarietjänster, Försäkringar, Lagringstjänster, Matchmaking, Lag, Tvistlösning, Kommunikation, Crowdfunding, och mycket mer. Decentralisering gör att makten slätas ut och det minskar möjligheten till korruption. Kommer bitcoin eller någon annan decentraliserad kryptovaluta bli den dominerande globala valutan i framtiden? Det får tiden utvisa. Bitcoin, history and possible future? Of course I realize that it is impossible to predict the future. This is only a ”What if it continues on the same trend picture”. 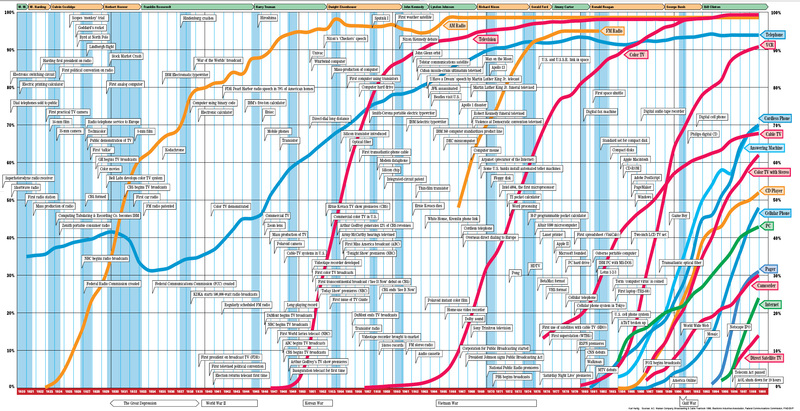 I expect the bitcoin price to follow a sigmoid curve like all successful new technologies. But I do believe we are very early on the curve. Where exactly is of course impossible to say. 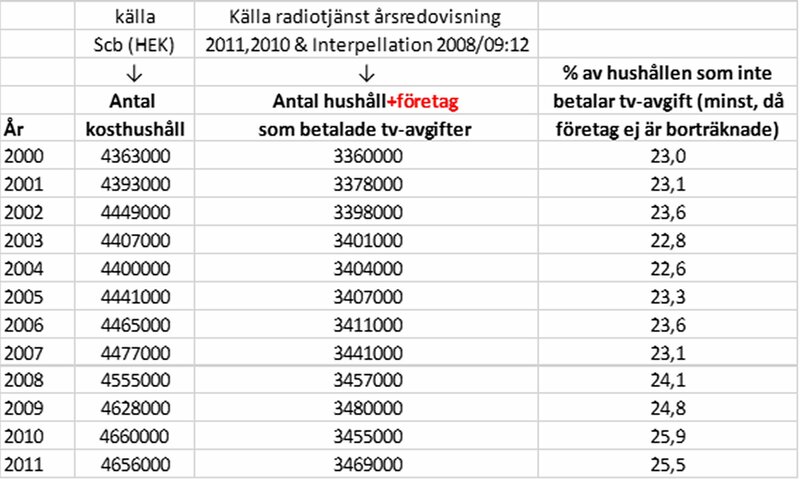 Radiotjänst vill alltså hävda att det folkliga stödet för tv-avgiften är högt och med stöd av det rättfärdigar de sina krav på att alla svenska medborgare bör tvingas betala denna avgift. Det redovisas dock aldrig några källor till stöd för påståendet. Kan det bero på att detta påstående är en ren lögn? Jag vill med denna enkla uträkning visa att det är troligt att det är betydligt mindre andel (ca 3 av 4 = 75 %) som faktisk betalar tv-avgift. Dessutom har andelen som betalar, och därmed även stödet för radiotjänsts affärsmodell sjunkit de senaste åren. Med kosthushåll menas det hushåll som utgörs av alla personer som den 31 december redovisat år bodde i samma bostad och hade gemensam ”hushållning”. I kosthushållet ingår barn som är 18 år eller äldre och bor hemma. Ett kosthushåll kan också bestå av flera generationer, syskon eller kompisar som bor tillsammans och har gemensamt hushåll. Personer som normalt tillhör kost­hushållet, men som tillfälligt befann sig på annan ort p.g.a. arbete, studier eller militärtjänstgöring ingår i kosthushållet. Barn, som bor lika mycket hos båda föräldrarna, räknas med om de var folkbokförda i det aktuella hushållet. Idag på SvD opinion så skriver Jens Holm (V) och Rickard Allvin om det hårt kritiserade ACTA-avtalet. Det är mycket bra att detta får den uppmärksamhet den förtjänar i Svensk media. Jag har själv både läst avtalet på svenska och engelska och läst mycket av den kritik som har riktas mot avtalet. Här är min analys. Ett av de tyngsta argumenten för EU-kommissionen och andra som förespråkar ACTA har varit att det inte kräver ändringar i nuvarande EU-lagstiftning. En utredning utförd av EU parlamentet har kommit fram till att så inte är fallet. Utredningen rekommenderar därför att ACTA-avtalet ska prövas i EU-domstolen. En studie av ACTA avtalets kompatibilitet med Europakonventionen om mänskliga rättigheter (EKMR) samt Europeiska unionens stadga om de grundläggande rättigheterna (ESGR) utförd av Douwe Korff professor i internationell rätt och Ian Brown framstående forskare inom informationsteknologi finner att ACTA-avtalet strider mot båda dessa. ACTA innehåller inte några rättigheter till ”fair use” samt ”fair comment” av upphovsrättsskyddat material i allmänhetens intresse, vilket oproportionerligt begränsar möjligheterna att söka och dela med sig av information och idéer i strid med ESGR. Upphovsrättighetsinnehavarnas rättigheter överväger kraftigt allmänhetens rättigheter då avtalet innebär att alla former av kopieringsskydd obehindrat kan implementeras och att dessa begränsningar alltid blir lagliga i relation till avtals- och konsumenträtt och olagliga att kringgå vilket oproportionerligt hämmar tillgång och spridning av information i strid med artikel 10 och 11 ESGR. Avtalet uppmuntrar internetleverantörer att övervaka och stänga av internetanvändare som misstänks för upphovsrättsbrott i strid med EU:s lagar om mänskliga rättigheter och dataskydd. Artikel 11 och 27.4 i ACTA tillåter omfattande hemlig övervakning och överförande av känslig personlig information utan konkret misstanke om olagligheter mellan myndigheter och upphovsrättsinnehavare inom och över landsgränser och mellan EU och icke EU-länder i strid med EKMR, ESGR och EU:s dataskyddsdirektiv. Den straffrättsliga delen av avtalet ger inte ett tillräckligt skydd för individens personliga integritet, rättighet till hemfrid samt rätt att ostört åtnjuta personliga ägodelar. Genom att avtalet inte understryker att rättsförelägganden ska ske i undantagsfall och rättegång utan att först höra den åtalade vara ett exceptionellt undantag är det inte i samklang med de garantier till en rättvis rättegång ”fair trial” som garanteras i EKMR och ESGR. ACTA har nyligen JO anmälts av sekreteraren för Liberaldemokraterna Per Pettersson för att det bryter mot Språklagen SFS 2009:600 §11 som föreskriver att ”språket i offentlig verksamhet ska vara vårdat, enkelt och begripligt”. Något som ACTA-avtalet knappast kan anklagas för att vara. Läs gärna den mycket välformulerade JO-anmälan. Tiotusentals människor har demonstrerat mot ACTA på Europas gator, över 2,3 miljoner människor har skrivit under en nätprotestlista på www.Avaaz.org och Polen, Tjeckien, Slovakien, Lettland och nu senast Tyskland har stoppat ratificeringsprocessen av ACTA. Det är en politisk och demokratisk skandal att regeringen kan hålla fast vid att stödja ett så människorättsvidrigt avtal som ifrågasätts så starkt och inte har ett folkligt stöd. Svenska regeringen måste backa, detta är helt ohållbart. Alla i riksdag och regering som inte omedelbart erkänner problemen med ACTA kommer få det mycket svårt att förklara sitt agerande för väljarna.